One of the buzzwords in urban design these days is “back alleys” or “back lanes. For some, it is about laneway housing, for others, it is the animation of back alleys with murals, cafes and shops as a means of creating a unique urban experience. Never liking to be left out of any new urban design trends, it was not surprising Calgary hosted a Backyard Alley Party on 17th Avenue SW, the last two September weekends. Will Craig, Senior Associate with Kasian Architecture Interior Design and Planning, invited me to join him on a sneak-a-peek walkabout of the back alleys on the north side of 17th Avenue SW just before the first Backyard Alley party weekend. I was shocked to find over 100 empty parking stalls on a late Friday morning just before lunch hour. Furthermore, I was surprised at how peaceful it was without any traffic. 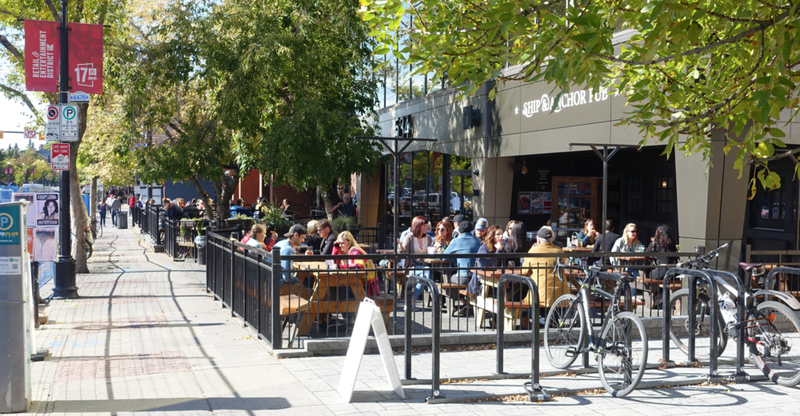 However, seeing all the everyday clutter of that alleys with industrial-sized garbage bins, fences, poles and barriers, it was hard to imagine the alley could be turned into a fun people place for patios, games, vendors and movies. But that is exactly what happened! However, being a sunny Saturday afternoon, the alley on the north side of 17th Ave SW was in shade while the sidewalk (front yard) was beaming in sunlight. So, not surprisingly, the back alley yard party was very quiet while the street patios were full of patrons. I understand the back alley animation picked up when the sun went down. FYI: Craig actually spent some time in Melbourne, studying how that city adapted its alleys for commercial uses and upon returning to Calgary, was keen to pilot something in Calgary. 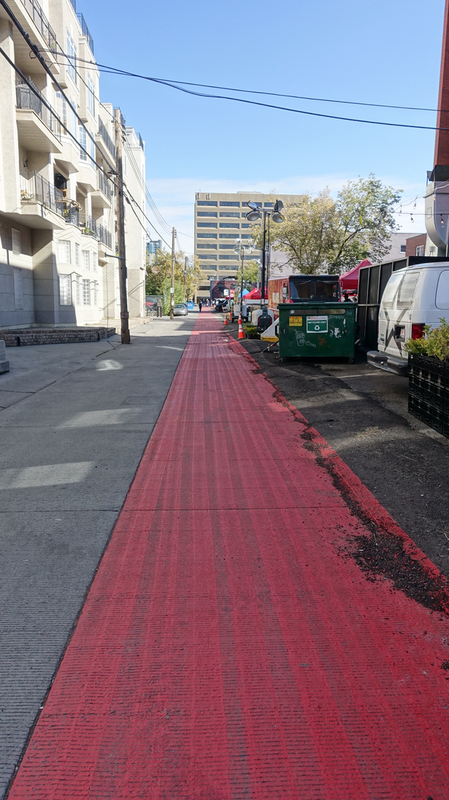 The 17th Avenue Backyard Alley Party was an experiment and will be tested a few more times as 17th Avenue SW businesses temporarily lose their sidewalk access due to construction. Lessons learned will help identify other City Centre alley experiments that might eventually lead to permanent commercial uses. The back alley behind the Ship & Anchor on a normal day. The Ship & Anchor back alley parking lot converted into s fun picnic games space. Ship & Ancho's 17th Avenue street patio on the same day as the back alley party. City Centre back alleys and laneways in Calgary (and most North American cities) are often seen as seedy places where illicit things happen, deliveries take place and garbage and recycling bins sit. The same is not true outside North America - Melbourne’s City Centre has become a popular tourist attraction because of the fun things to see and do in their back alleys, called laneways. After reading this, it was all I could do to resist immediately booking a flight. 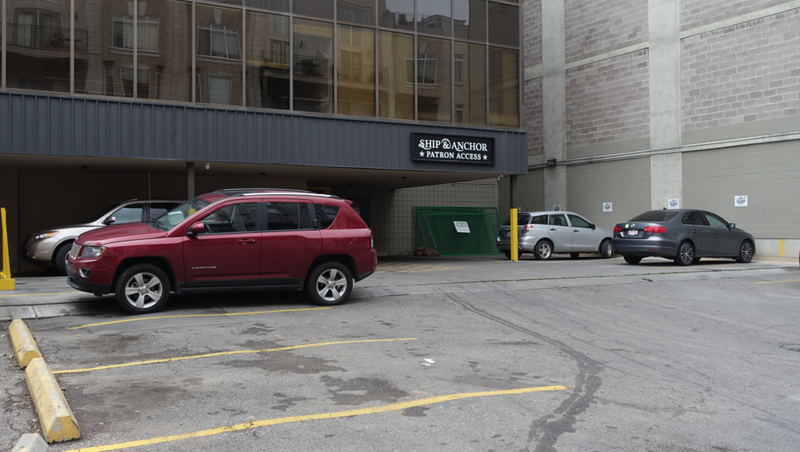 Perhaps Calgary’s best back alley hot spot was in the historic Grain Exchange Building where in the ‘80s, the basement Beat Niq jazz club (later it became Wino’s and now vacant) was a popular nightspot. With the entrance from the alley on the south side of Stephen Avenue, it had just the right amount of seediness that you would expect of a New York City back alley jazz club - especially with the Pic Niq restaurant upstairs. Metrovino opened in 1996 (and is still open) as part of the redevelopment of a common Beltline warehouse building in the middle of the 700 block of 11th Avenue SW (once known as the Design District). The building included Metovino, The Cookbook Company, Paul Kuhn Art Gallery, a restaurant (currently Decadent Brulee) and offices (CityScope Magazine, now Avenue Magazine and Sturgess Architecture). It predates the East Village’s mixed-use Simmons Building by 20 years and was a private entrepreneurial enterprise. Metro Vino back alley entrance. 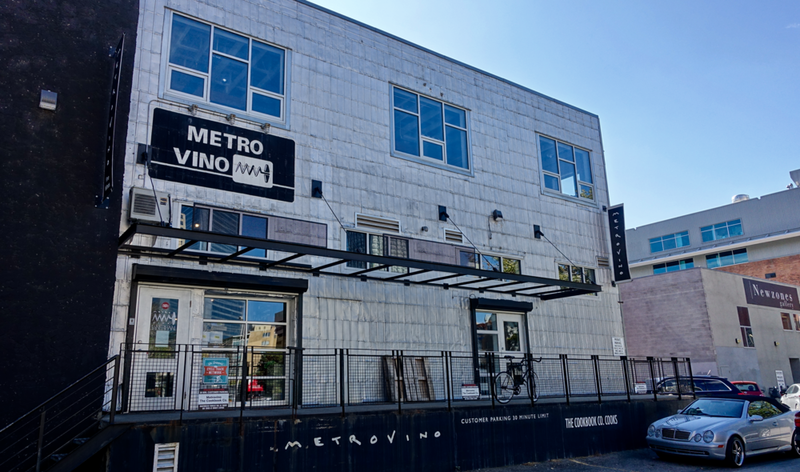 Though you can access Metrovino from 11th Avenue SW by walking through the Cookbook Company store, the front door actually is in the alley at the back of the now metal-cladded industrial-looking building. Most days owner Richard Harvey’s bike sits in the alley on what was once a loading dock, magnifying the urbanity of the alley. Village Ice Cream's parking lot patio. Village Ice Cream is yet another success story, opening up in 2012 in an unused space at the back of an Engineering Office at the end of 10th Avenue SE in Victoria Park. Talk about off the beaten path! However, it has been so successful, two new locations have since opened – one in Britannia and the other in Marda Loop. 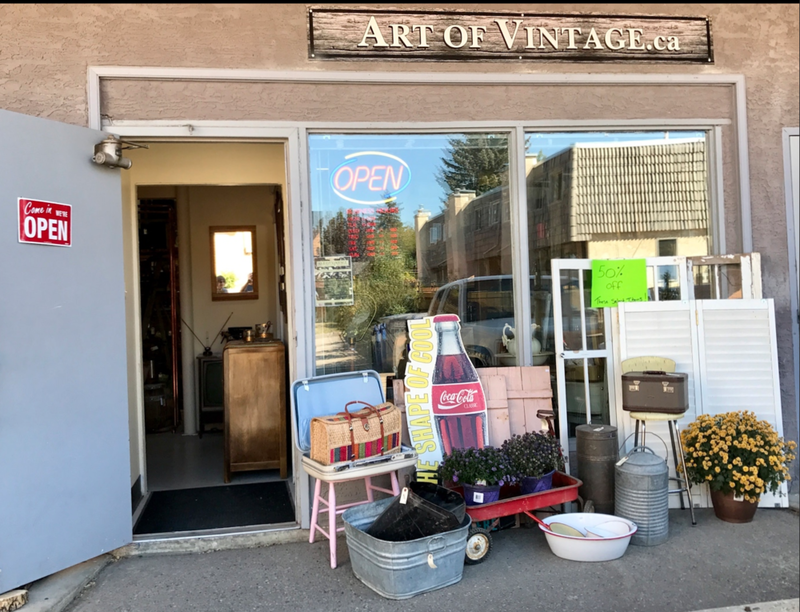 Then recently, I stumbled upon Art of Vintage - in the back alley of a small non-descript commercial building at the corner of 23rd Avenue and 29th Street SW in - of all places - Killarney. It is an intimate space full of curated Western Canadian artifacts – some for sale, some for rent (yes, you can rent them for your next theme dinner party). I believe it is exactly the kind of place you would find in a Melbourne laneway. Art of Vintage back alley entrance. As is The Brewer's Apprentice a new craft beer store in East village that is located in the alley between N3 condo and St. Louis Hotel. 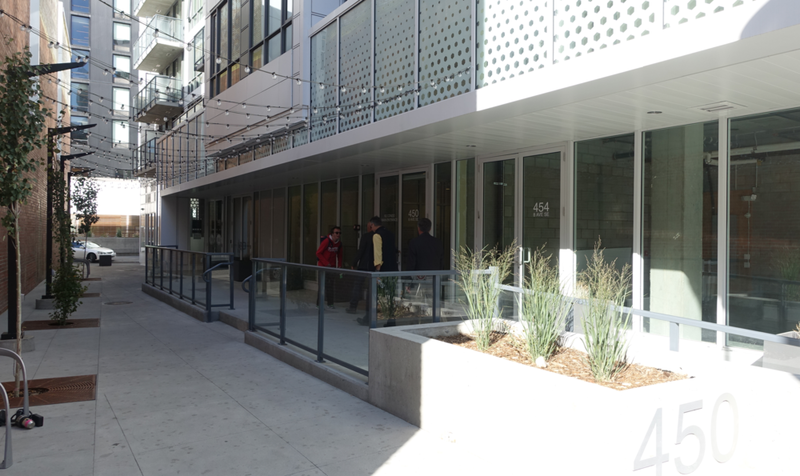 In fact the entrance of the N3 condo is in the alley so the entire building could be considered laneway housing. It is easy to miss the entrance to the Brewer's Apprentice in East Village. Calgary has experimented with some back alley establishments over the years, but all have been “one-off” initiatives. What is needed is a comprehensive back alley plan that would create a critical mass of things to see (murals) and do (cafés, bistros, boutiques) that create a unique urban experience and make living in our City Centre more attractive. Note: This blog was originally published in the Calgary Herald's New Condos section on October 28, 2017 titled "Back Alley Envy: City Life In The Lane." Is Calgary Really Ready For Urban Living?